The primary reason for making the switch to a smart thermostat is to save money on your heating and cooling costs. 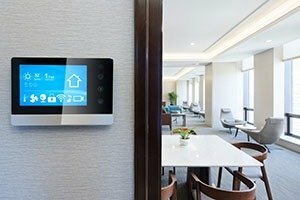 While smart thermostats require an upfront investment, you can quickly recoup the cost of one with the money you will save on your lower energy bills. These savings come from the smart thermostat’s ability to maintain your desired indoor temperature more efficiently, so you aren’t heating or cooling an empty office or room unnecessarily. One of the neat things about smart thermostats is that they are… well… smart! Every time you or someone else adjusts the thermostat to change a temperature setting, the smart thermostat will remember the activity. Over time, it will learn the preferences of the employees and adjust accordingly. This means no more wasted time standing in front of the thermostat programming it each season when the weather changes and you switch from heater to air conditioner or vice versa. Smart thermostats have a wireless connection to the Internet. This allows users to adjust the temperature when they are away from the thermostat and out of the office. As long as the user has an Internet connection, they can make changes to the thermostat as if they are standing right in front of it. This is ideal for business owners and managers who travel often. To discover other advantages of maintenance agreements as well as smart thermostats, get in touch with our team of commercial HVAC experts at Wilson Refrigeration and A/C Service today. Great Customer Service. I use them at home and at work and are always prompt in sending a technician out.